At home I have signed up for BT Total Boardband, which touch wood has been working well so far. With Option 3, you get the BT Home Hub and Phone which is a wireless router with a few ports at the back so you can plug in your phone for VoIP, two ethernet ports (using one for my powerline adapter) however tonight, I went into the Network on my laptop and noticed a item called Thomson. Immediately I thought we had been hacked!! It wasn’t showing up in the admin section so started to get a little bit concerned. In one of the pages it had this unknown device listed as being connected to ethport3 (yet only two ethernet ports) with an IP of 192.168.1.253. A little bit of digging and I found that this is for the usb port on the hub. So, I plugged in a small USB pen (which I got free from Google), went back into Network and there was a shared folder of bt_7g, this was my usb pen. My home hub is now a NAS box with full read/write ability. Very cool and free! On bad point is that my 4Gb pen I’m not using doesn’t fit, need a little cable so it can break out the back. 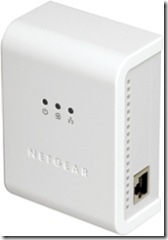 Today I received my order for the Netgear NDXB101 Powerline Ethernet adapter so I thought I would write about my initial thoughts. The HDXB101 contains two HDX101 adapters which plug into the wall and allow you to connect a standard ethernet cable to them, once you connect the second device to a second plug socket in your house you have a network! There are a number of reasons why I purchased this over Ethernet. Firstly, speed was a concern. 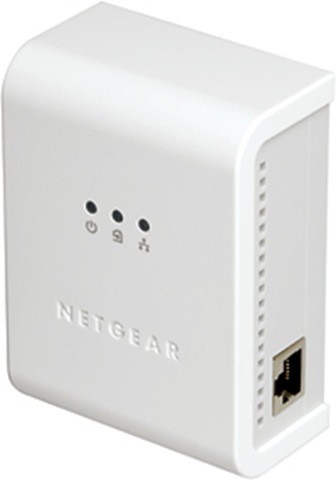 I am using this to connect my desktop to my router at opposite ends of the house and there are a number of other wireless networks in the area and interface was affecting the speed. Plus, streaming video or anything over wireless isn’t great. Secondly, while security isn’t a huge problem if you use WPA (compared to WEP) it still is a concern. All the traffic sent between the two devices is encrypted. I need to connect my XBox 360 to my router so how, which meant buying an overly priced wireless adapter. Now, I can just buy a single one (buying the pair works out a lot cheaper) and use this to connect to my existing adapter which is connected directly to my router and have the speed advantage. Plus, from the viewpoint of Vista, it’s connect to directly to my router. No messing around waiting for it to detect the wireless access point or access keys. 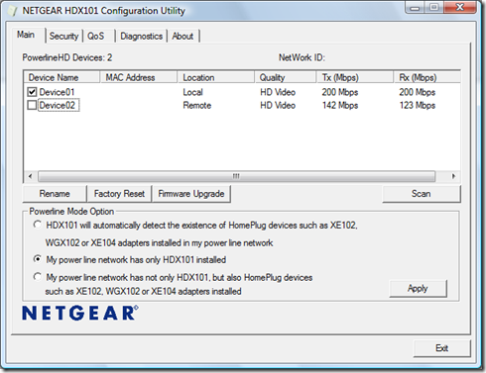 While the adapters don’t need any software installed to work correctly (just plug in and go), Netgear provide some software to help manage your network. You can also use this software to rename the network ID, just incase of any other network is connected to the same power supply (like in apartments). The software also provides an indication of the speed which you are likely to get out of the connection. While it isn’t 200Mbps (and I never expected to get that), it is better than wireless. No problems with the software, or the devices, working in Vista. However, I did have two problems when I was setting up the kit. They don’t work correctly (slow speed) if you connect them via a surge protector, so I need to go buy something from Tesco’s on Saturday as running out of normal plugs now. Secondly, I needed to plug the Ethernet cable into Ethernet port 2 on my BT Home hub, Ethernet port 1 didn’t work. Apart from that, they seem to be doing the job.